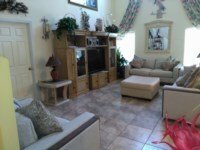 5 bedroom, 3 bathroom villa in the Lake Berkley Resort community. Owned by terry bromley. Ref: 74. 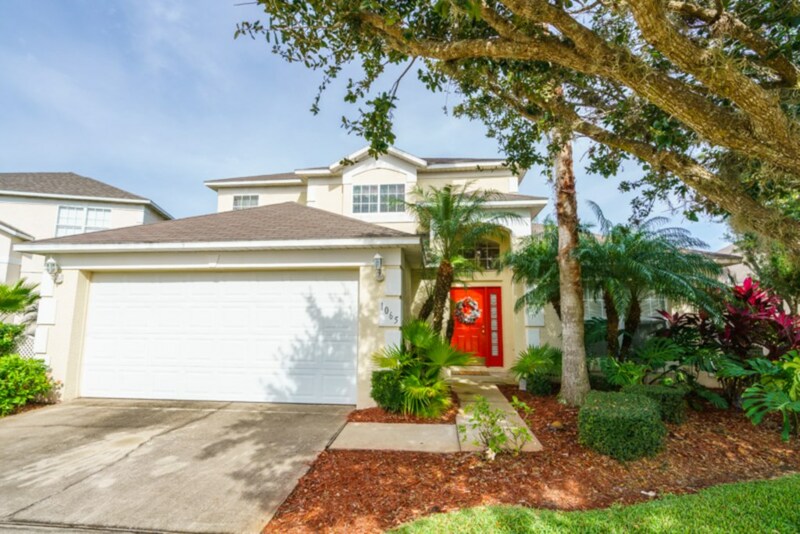 LOCATION.Scarlets villa is located in the quiet, exclusive community of Lake Berkley Resort, situated just off the 192 and directly behind Medieval Times castle. The moment you turn into Lake Berkley you will sense what a truly special place this is. You enter through electric gates with 24 hour manned security - offering privacy and that extra peace of mind. Our home overlooks the stunning lake and conservation area - DisneyWorld is just 10 minutes away and Universal Studios 20 mins. 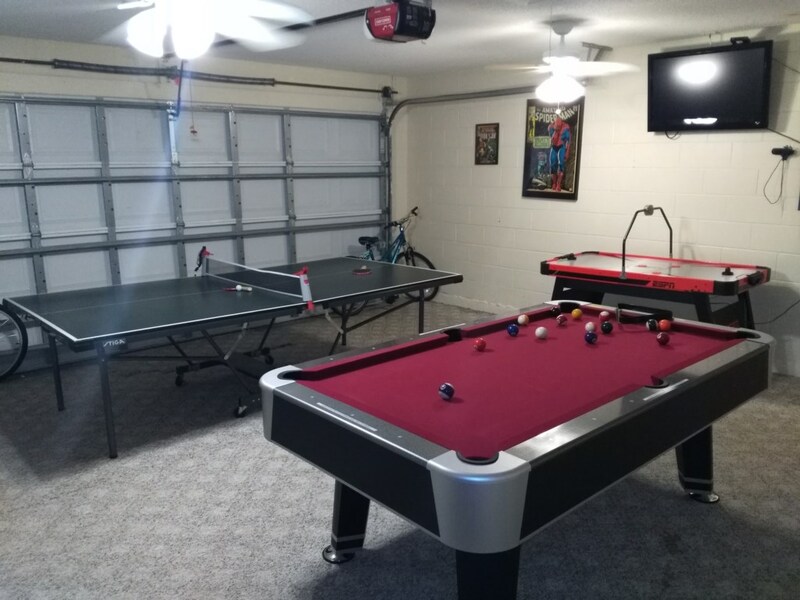 It is also a superb location for golf enthusiasts.The Family room is an open plan living area which overlooks the lanai and pool through to the Lake and conservation area. There is a magnificent open-plan staircase climbing to the first floor. 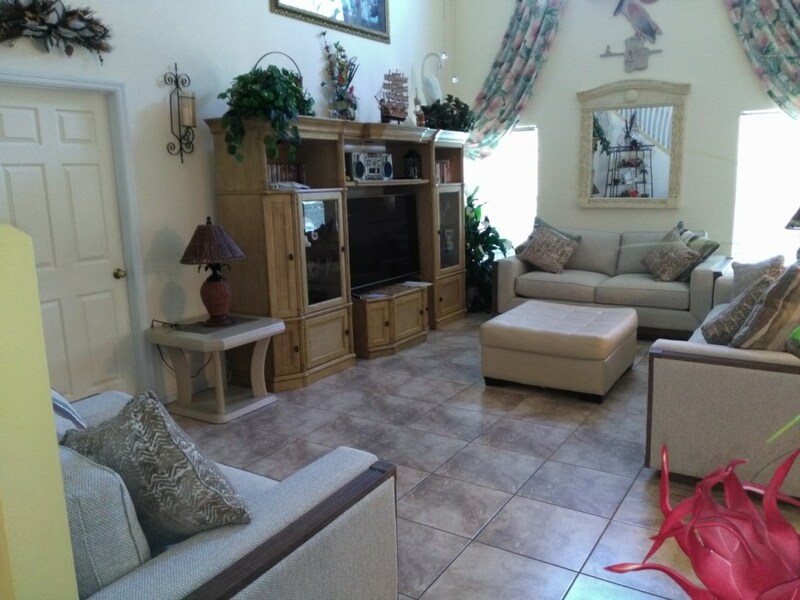 There are numerous large sofas and chairs for your comfort and you have the choice of watching the 38" large screen cable TV or alternatively relax watching one of the DVD's. Of course there's always the option to watch the sunset after a hard day at the parks!The 1st Master Bedroom has a massive king-size bed.There is a 27"cable TV and video player. A telephone / clock radio and hairdryer are also provided. To the other side of the bedroom is a huge bathroom with a built in wardrobe, a WC room and the corner jacuzzi tub, a massive walk in shower and, of course, his & hers sinks.The Games room has a pool table, full size table tennis table and electronic darts . The kitchen includes everything you could want: large fridge/freezer with ice maker, oven & hob, microwave, dishwasher & waste disposal. All housewares are already there for your use, including dinerware for 12 people, electric kettle, coffee maker, corkscrew and plastic tumbers and plates for our younger visitors.A breakfast area provides an informal eating area that seperates the kitchen and living room.The dining room includes a large table with chairs will also find a selection of games & books.Also on the ground floor we have a bedroom with twin beds and a bathroom with shower.There is a beautiful pool, 31ft by 15ft, with underwater lighting. For an extra special effect fibre optics run around the edge of the pool. Adjacent to the pool is a 7ft spa with a waterfall running into the pool. 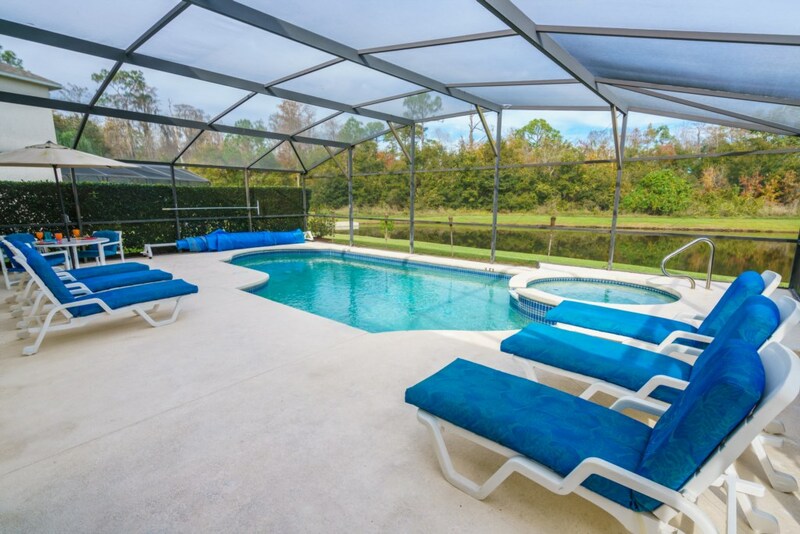 In the cooler months the pool and spa can be heated, although an additional charge will apply.There is a large pool deck with a table and four chairs, and in the lanai area there is a exterior fan fitted for those times in the day when you have had enough sun and require that extra breeze. This area can also be used for outside dining for those special Florida evenings & mornings.The pool area is fully screened to minimise nuisance from insects and there is plenty of poolside furniture/recliners to relax upon and enhance your enjoyment of those long hot Floridian days.The Upstairs Master Bedroom as a King-size bed, a dresser, 19" cable TV, and hairdryer. 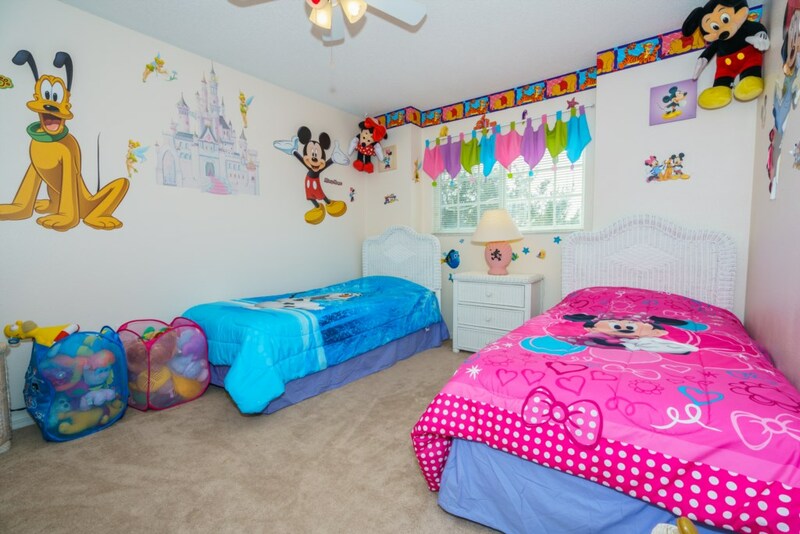 There is also a large closetThe third bedroom is located at the front of the house and it is furnished with a queen size bed, large chest of drawers, lamps, clothes closet and of course a 19" TV and hairdryer.Located at the front of the house you will find the Disney themed room. There is a clothes closet, chest of drawers and even a Disney cable TV. Children's games, jigsaws, books and even the odd Disney toy are provided to keep everyone happy. Plus the Playstation 2 with games!Also upstairs is a full bathroomIn the villa there is also:-Utility area with a heavy duty washing machine, tumble dryer, iron & ironing board.The house has an emergency lighting system in the unlikely event of power failure.All doors to the pool and lania are alarmed in order to give parents of children that extra peace of mind. There are plenty of coat hangers, towels, pool towels and spare bed linen avaiable. Our Villa is fully licensed for Short Term Rental with the local authorities. Low season prices from $1050.00 / £600.00 per week. Peak season prices from $1225.00 / £700.00 per week. We have rented this villa several times since 2013. It's our home away from home! The villa is meticulously kept and spotless! 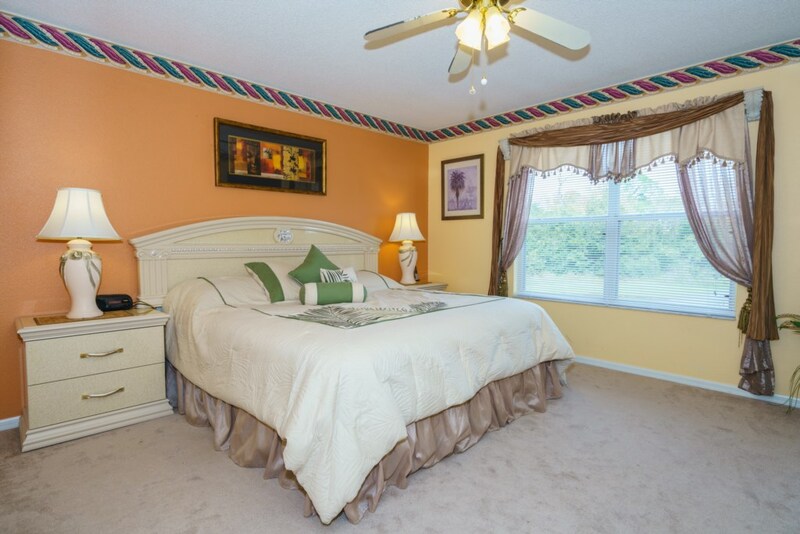 It is has everything you need and is very close to the theme parks. 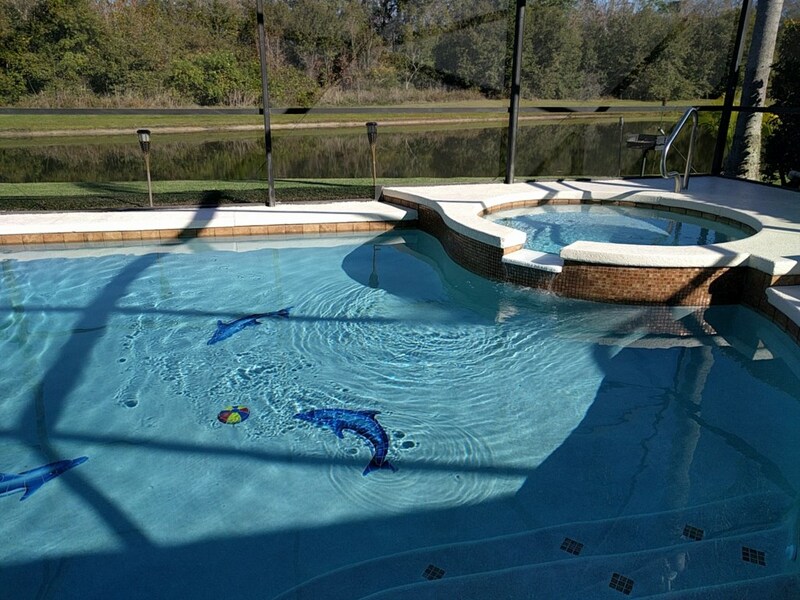 The pool and hot tub are a welcome retreat after a long, hard day of shopping or running around theme parks. Morning coffee while watching the wildlife across the pond was the perfect way to start each day! The management company and owners are only a quick phone call away if you have any questions and are happy to help. There is nowhere our family would rather stay when visiting the Orlando area! We stayed at the villa for 13 days over our Christmas vacation. Everything was perfect. The villa is fully stocked and has everything you could possibly need. The pool and hot tub were perfect to relax in and the kids swam as much as they could. Location was close to most everything. We would absolutely stay again if we are back in the area. Highly recommend!! Lovely villa, inside and out! The home was beautiful, clean, comfortable, and showed pride of ownership, with updated appliances, televisions, and furnishings. 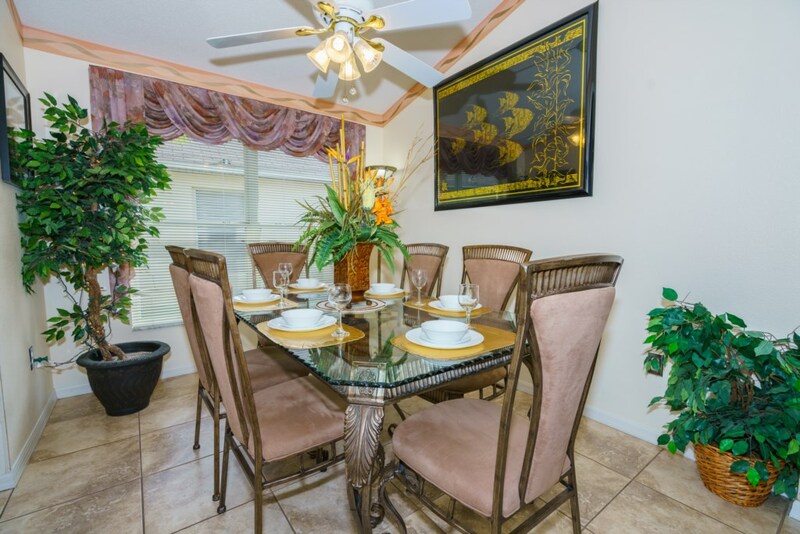 It was located in a safe, manicured, gated community less than a half hour from Universal Orlando. It had EVERYTHING my family of eight needed for a relaxing, fun-filled vacation. The pool and hot tub were especially great, and backed to an amazing conservation view! With privacy hedges on each side, it felt as if you were on your own private island. It was wonderful! The owners and management company were prompt in communication, kind and professional, and made the rental process straightforward and simple. My family and I had a fantastic vacation at Scarlet's Villa and hope to return again soon! Great time, great resort and Villa is amazing with views over lake. Thanks Terry hope to come back again. Our perfect home from home ?? This was our 5th stay at Scarlets. The villa is in a fantastic location close to the 192 and all theme parks. The villa itself has everything you could ever need to make your stay as relaxing as possible. 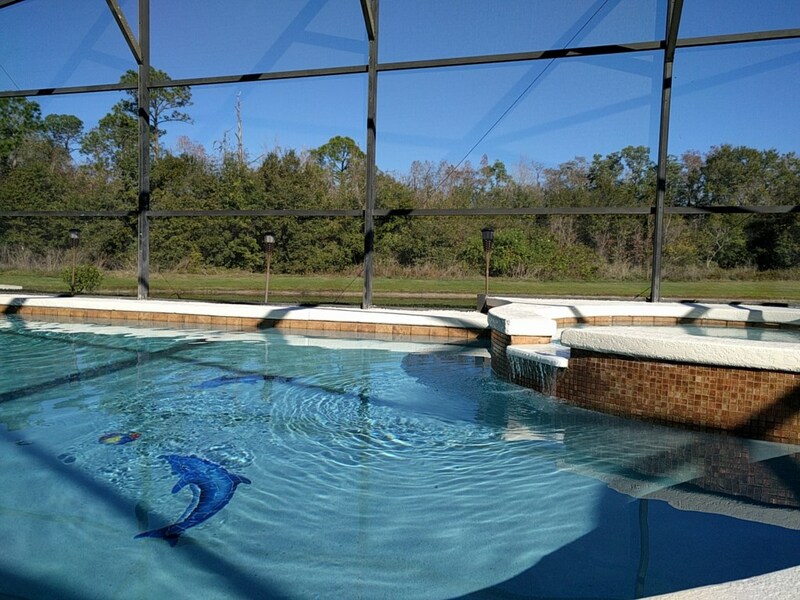 We especially love the pool area and fantastic view over the pond. 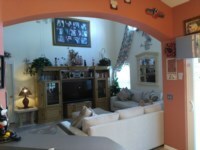 The villa has good spacious rooms and is the ideal base for any Disney holiday. Every time we come to this villa it gets harder to leave. The owners and local management company really go that extra mile to make sure your stay is as comfortable and more importantly as memorable as possible. We will be back for stay number 6! This beautiful family 5 bedroomed villa Is located in Kissimmee. 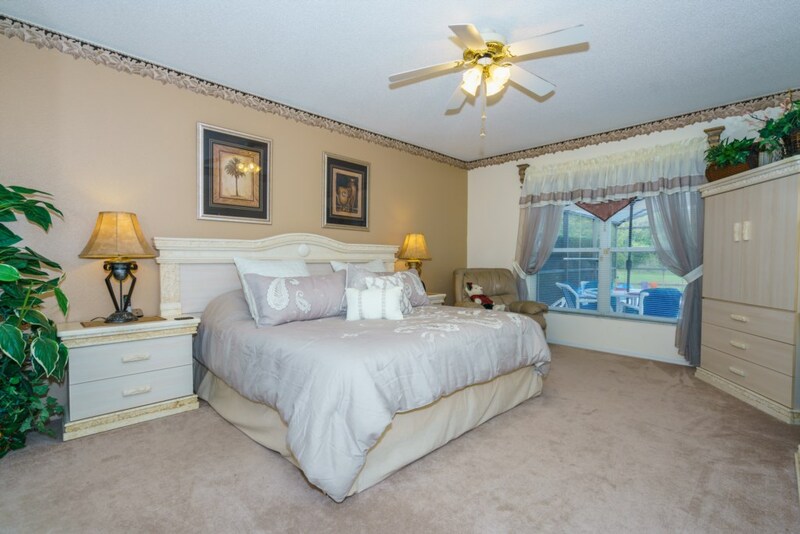 It is situated at Lake Berkley which is a safe gated community. It is a lovely villa inside and out which has everything you need for your stay. It has a large pool with Spa. It is located not far from the Disney parks. We absolutely loved staying there. We had a fantastic holiday. Would definitely recommend this villa to anyone! Would definitely stay there again. Thankyou Terry & Pat for letting is stay in your lovely villa. Our stay at this villa was perfect from start to finish. The owners have thought of everything you could possibly need to have a relaxing holiday with nothing that isn't catered for. The whole house is very well maintained and has a luxury feel to it. From the huge main bedroom to the large pool area everything is all you could want in a holiday villa. 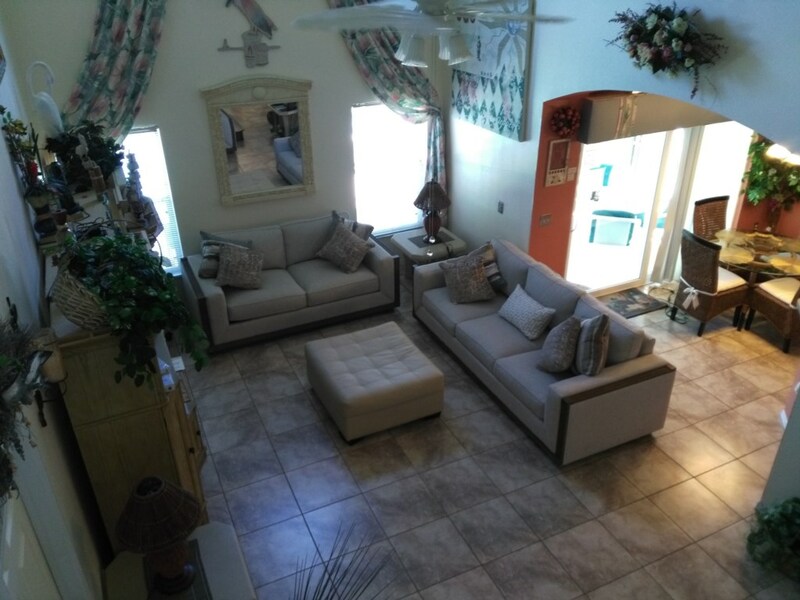 The owners are excellent in responding to any queries you have and the management company in Kissimmee were very good in making sure everything was to your satisfaction. All in all I cannot recommend it highly enough and have no hesitation in saying you will not be let down by taking a holiday here. We have just returned from our second stay at Scarlets Villa. We enjoyed our first stay so much that we didn’t look anywhere else when booking our recent trip to Orlando. The villa itself has everything you could need and made a great base for our family travelling with children. The pool is larger than others we have seen and is very private with a beautiful view to the lake. It is in a brilliant location for accessing both Disney and International Drive, and Lake Berkley resort is lovely and quiet as a nice break from the parks. Scarlett’s Villa in Lake Berkeley Resort off the 192 Kissemmee is a Beautiful Villa in a great location convenient to everything shops and attractions etc WALK or DRIVE ( to Shops ie Walmart ) depending on your choice Fantastic Pool Area well Furnished with beautiful calm Lake Views and The Villa Itself is Beautifully furnished throughout and so comfy Really lovely time HIGHLY Recommend and Terry & Patricia ( Owners ) great to deal with as is their on site Management Company ( Knud was very helpful) will definitely re book ?? 10/10 ? We’ve just returned from a 3 week stay and had a fabulous holiday! My husband and I had a huge bedroom with a massive en suite and our 4 kids and partners all had lovely bedrooms with use of 2 additional bathrooms. The villa is located in a lovely quiet resort and although we had our own gorgeous pool and games room we also had use of the resort ‘s clubhouse with gym and pool. All in all a wonderful vacation , thank you Terry!! Your enquiry will be sent to villa ref 74 only. This page has been viewed 61726 times since 01 Feb 2002.